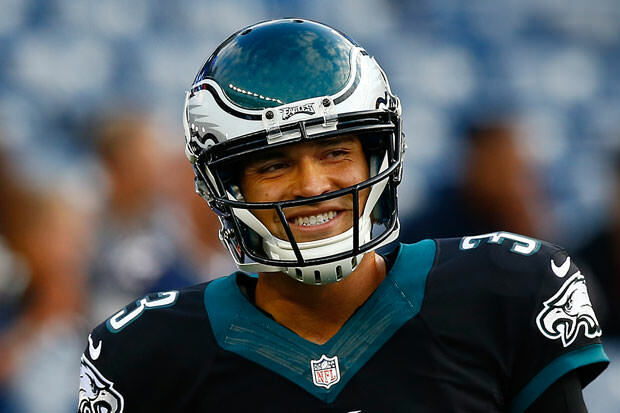 If there is anyone in the NFL known for snacking on the sidelines, then it’s Mark Sanchez. Fans will remember when he was the Jets starter in 2009 and took a moment on the sideline to eat a hot dog while winning a game against the Oakland Raiders. Sanchez might not be starting anymore, but he still knows what’s good at the concession stand. A video was leaked of the Philadelphia Eagles thrashing of the Giants last weekend that shows Sanchez coming up to starter Nick Foles on the sideline and encouraging him to try the chicken tenders being sold at Lincoln Financial Field. Sanchez said to Foles. However, Foles did not take him up on his recommendation. Not everyone likes to eat during the game, in fact, we’re not sure that anyone but Sanchez does this.